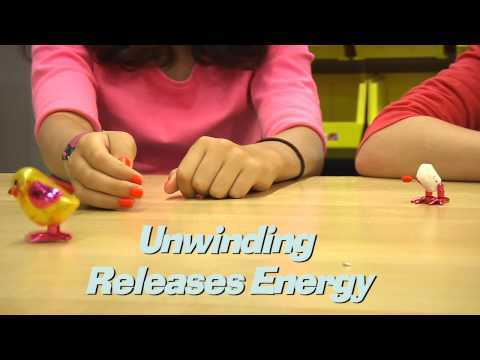 My two assistants and I enjoy playing with wind-up toys (available at Fiddle Sticks Toys at the Children’s Museum of Houston), but how do they work? Well, as I told them, the best way to find out is not the Internet, but to break them open and see what’s inside! So, inside a wind-up toy is a spring, but not what most people thing of as a spring; they have a torsion spring (it looks like a coil). When wound, the coil gets tighter as it stores up energy. When released, the coil slowly unwinds, transforming the stored energy in the coil into kinetic energy, which the mechanisms inside the toys change into different types of motion. But can you make your own wind up toy? Attach the paper clip to the rubber band. Run the rubber band through the spool. Tape the paperclip to the spool making sure none of it hangs over the edges. Run the rubber band on the other side of the spool through the washer. Put a pencil through the open loop of the rubber band. Wind the rubber band by spinning the pencil around and around. Put it down on the table or floor and watch it go! This is the same basic thing as the torsion spring. When you spin the pencil, the rubber band gets twisted. Because rubber bands are elastic, they want to return to their original shape. So, by twisting the rubber band, you store energy in it. When you put down the racer, the rubber band untwists, releasing the stored energy and converting it into kinetic energy!